So, what exactly are digital skills? Cornell University defines digital literacy as ‘the ability to find, evaluate, utilize, share, and create content using information technologies and the Internet’. The writer Marc Prensky coined the terms ‘digital immigrant’ and ‘digital native’ and to continue the language analogy further, the prospect of learning new digital skills can make it feel like you’re entering a new country full of strange customs and complicated language. Then, to make it even more daunting, the customs and vocabulary are constantly changing and being updated. It is no wonder that we are facing a digital skills shortage. For the older generation of workers, learning new digital skills can be even harder. A survey from Business in the Community, The Missing Link: An ageing workforce in the digital era found that those over 50 are not receiving the training and skills development they need to succeed in the digital era. They questioned 2,000 employees, 1,000 of whom were over 50 and found that 62% of workers in their 50’s had not received training in computer skills. The report also found that only 25 per cent of employees aged 50-59 and 22 per cent of those aged 60-69 felt their employer encouraged them to take up learning and development opportunities, compared to 44 per cent of 18-39 year-olds and 32 per cent of 40-49 year-olds. Recommendations include improving the company culture to promote lifelong learning, developing targeted training and re-skilling support for specific groups of older workers, ensuring that development and work opportunities are easily accessible. In January this year The Digital Economy Unit, within the Department for Culture, Media and Sport in conjunction with the Department for Business, Innovation and Skills, commissioned a study to help improve the understanding of the current and future demand for digital skills in the UK economy. This study examines the demand and supply of digital skills in the UK and reviews the risks for the UK if the digital skills needs of the population and businesses are not addressed. The findings of the study will inform the government’s digital strategy, as a key element of their Productivity Plan. What is the current demand for digital skills across the economy and what are the different types of digital skills requirements? What barriers and market failures to the development of digital skills have emerged during the last decade? What are the areas of shortage or mismatch (skill mismatch is defined as the gap between an individual’s job skills and the demands of the job market) of digital skills in the workforce? How can the supply of digital skills meet the demand of the labour market? These questions could also be a very useful starting point for many organisations to assess their own digital workforce crisis and invest in a plan to rectify the shortage in the future. The report highlights the risks and opportunities and suggests some recommendations for government policy and businesses alike. 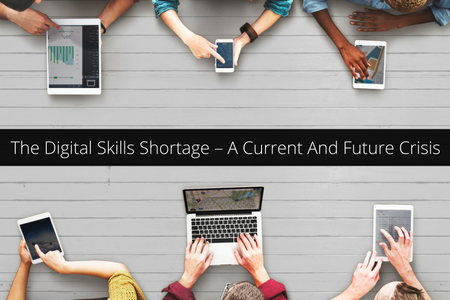 It has been established in this report and elsewhere, that there is a shortage in suitable digital skills in the UK labour market. The UK’s investment in IT and utilisation of digital skills is lower compared to other major countries, which poses a major risk to successful business growth and innovation. Those organisations that have invested in the uptake and application of digital technology in the workplace have shown an increased market competitiveness, and those that have a developed their ICT infrastructure and taken advantage of digital technologies tend to be the most successful. The contribution of digital skills to the performance of the economy is substantial. The ‘tech sector’ alone represents 6% of the UK economy and is growing year by year, and a strong investment in digital skills would likely bring about a very good return on investment to the UK economy. Currently, 72% of large companies and 49% of SMEs are suffering tech skill gaps. This shortage represents a key bottleneck for industry and is linked to one in five of all vacancies. There is a clear mismatch between the skills demanded and those the workforce is currently offering, which is likely to be holding back the growth of all companies, whether high or low tech. Digital skills are needed throughout the workforce, but supply is simply not keeping up with demand. There is also a lack of awareness of career opportunities within the digital sector, sometimes reflecting skill and gender stereotypes around the types of roles that exist. Women are under-represented on higher education courses in computer-related subjects, and within the industry as a whole. The recommendations from the report focus on the role of central government in providing economic policy direction, national focus and leadership, but they also emphasise the critical roles of employers, the education sector and local government in delivering solutions that address the digital skills gaps and shortages in the UK. 1: Government should provide leadership, coordination, and key resources in establishing the conditions for digital skills development. 2: Employers should take ownership of digital skills development. 3: The education sector should develop and adapt their offers to meet the changing needs of the digital economy, working within the policy and funding frameworks. 4: Local and regional government and agencies should address the digital skills needs of their local areas. We at Chapple, recruiting in the change and communications space, are finding the demand for specialist digital communications professionals is currently dramatically outstripping supply and the market is reaching a crisis point. The majority of businesses are increasing their investment in vital digital communications, and need ready-made, strong digital skills such as content creation, social media skills, and online community management expertise. Meanwhile candidates with these skills and the experience to go with it are in constant demand and can name their price. This digital crisis can so easily be turned into a great opportunity if we work together to address education, vocational training and investment in technology awareness and how to up-skill a willing workforce.